My mother-in-law has two gorgeous pastel drawings of Sam, her eldest son, and Clay (now my husband and the mischievous middle child) when they were adorable little guys. She always told me that she regretted not getting a drawing of Todd, the youngest son, who was a little baby at the time. Understandably, the artist charged double for babies, seeing that babies don't care to look in one given direction while they're being drawn. That being said, I don't know how the artist managed to get Clay to sit still for 20 entire minutes to get drawn. That'll always be a mystery. 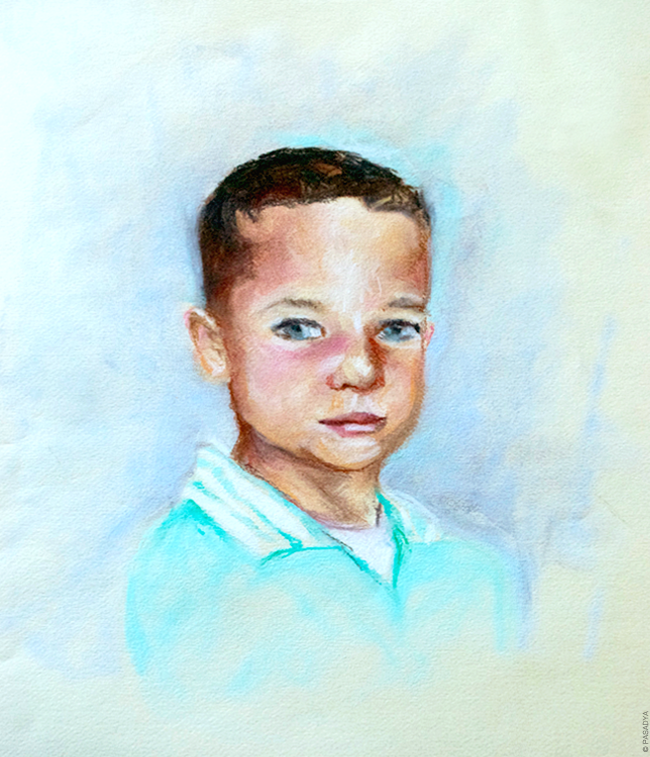 I thought it would be so cool to try and replicate the artist's style and create a pastel drawing of tiny Todd as a four or five-year-old (I can't tell how old he was in the photo), and above is the result. I'd say it looks 90ish % like the real Todd. But hey, for my first real pastel piece, I suppose that's alright. I guess it would've been nice if I remembered to take photos of Sam's and Clay's portraits so you guys could have seen all three boys together. Whoops. Maybe I'll remember at some point.